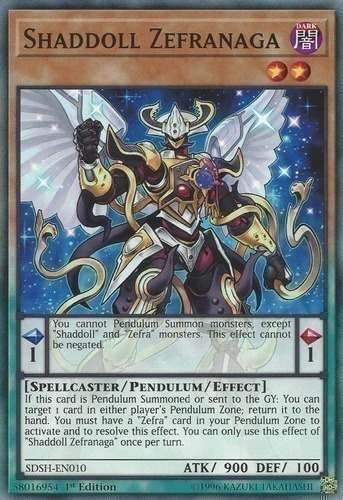 Monster Effect: If this card is Pendulum Summoned or sent to the Graveyard: You can target 1 card in either player's Pendulum Zone; return it to the hand. You must have a "Zefra" card in your Pendulum Zone to activate and to resolve this effect. You can only use this effect of "Shaddoll Zefranaga" once per turn.